Julian Assange, editor of whistle-blowing website Wikileaks, has criticised mainstream media for not making proper use of “primary resources” and claimed that the site has created “a real free press (…) for the first time in history”. Speaking at the Centre for Investigative Journalism Summer School at City University London on Friday, Assange accused the media of failing to consult important evidence in its reporting of a 2007 US Air Force strike that killed two Reuters news service employees and several Iraqi civilians . The attack became infamous after a video of the event was leaked through WikiLeaks, entitled Collateral Murder. The footage was recorded by one of two Apache helicopters involved in the attack. Showing an alleged copy of the US Military’s 2007 rules of engagement hosted on WikiLeaks, Assange said: “We had the raw ingredients you needed to decide right there. Why didn’t they use them? Assange argues that it is clear from the document that the Apache pilot broke the rules of engagement. He said journalism needed to work towards making more primary source material such as this available online, arguing that this was the standard process for scientific investigations and that it should be the same for journalism. You can’t publish a paper on physics without the full experimental data and results, that should be the standard in journalism. You can’t do it in newspapers because there isn’t enough space, but now with the internet there is. Last week, Private First Class Bradley E. Manning, who is accused of leaking the video along with tens of thousands of classified State Department cables, was charged by the U.S. Army with mishandling and transferring classified information. Assange will not attempt to enter the US for fear he might be subject to a subpoena concerning Manning’s leaks. Citing another of the site’s leaks, concerning Carribean tax haven the Turks and Caicos islands, Assange praised the anti-corruption reporting of online-only, local news outlet the Turks and Caicos Journal, which he said was hounded out of several countries after law firms threatened its internet service providers (ISPs). Warning of a new “privatised censorship”, he said that the Journal’s Googlemail account had been subpoened under US law and that Google agreed to surrender details of the news outlet’s account, at which point WikiLeaks stepped in to provide a defence attorney. He heavily criticised the search engine company for its behaviour in the TCI Journal case, and challenged the actions of ISPs in India, Japan and the US for allegedly agreeing to cut the Journal’s internet access rather than risk incurring legal costs. According to Assange, Googlemail is a completely insecure way of storing information. He claimed that the Guardian had recently transferred all of its internal email over to the Google service. 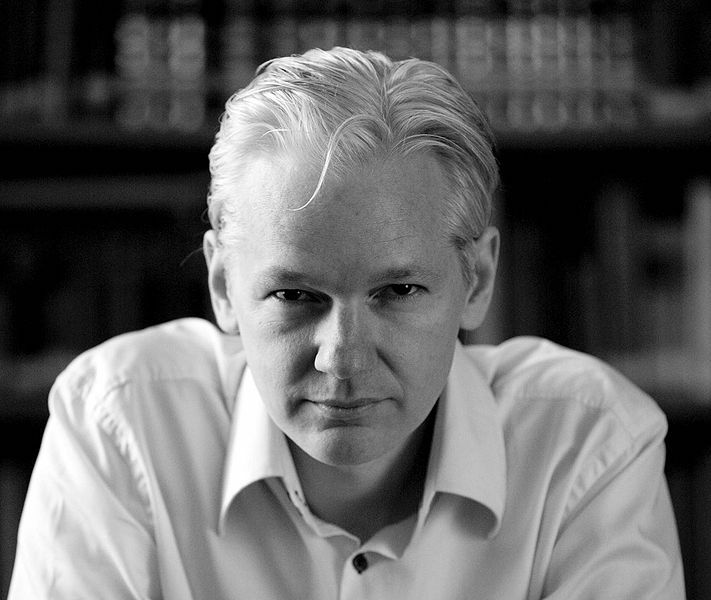 Asked about WikiLeaks’ funding, he said the site has so far raised $1 million dollars in donations but revealed it had had an application for a $650,000 grant rejected by the 2009 Knight News Foundation, despite being “the highest-rated applicant out of 3,000”, and heavily implied it was a politically-motivated decision. Earlier this year, WikiLeaks put forward a proposal in conjunction with Icelandic MPs to create a safe-haven for publishers – and their servers – in the country. Last month the proposal, known as the Icelandic Modern Media Initiative (IMMI), was passed by parliament and will change Icelandic law, aiming to increase the protection afforded journalists, sources and leakers. This entry was posted in Citizen journalism, Events, Politics, Press freedom and ethics and tagged Centre for Investigative Journalism, collateral murder, julian assange, turks and caicos journal, Wikileaks on July 12, 2010 by Joel Gunter. Is it possibel to translate this article and put in an german blog? If you google the word “caicos” in Google News, the “TCI Journal” does not come up although all the writings of Chris Burke do. “TCI Journal” is a community effort that is doing extraordinary work in the face of evil. It is the source locals read. I do not use the term “evil” lightly. Just read the TCI Journal’s recent articles about “Redbridge,” and “Southern Health Network.” Also read about the NHIB (National Health Insurance Board) and Haywood McIntosh. Please read this series of articles in the “TCI Journal” as the story of what is happening here in TCI deserves to be reported in the UK. These articles are posted on line. I am in TCI and the story of TCI’s off-island medical care is very serious. We need your help getting the story out. A little sunlight will go a long way. I also was moved to comment based on the TCI Journal “honourable mention”. I think that it was ludicrous for a lawsuit to unveil who was behind the comments from the Google account. It made me question internet security. It is not just Chris Burke writing about how unfair TCI Journal is. There are other writers out there including the mainstream news in TCI. There were articles in the Turks and Caicos Sun News, Comments in the Net News, TCIPost articles. I hate to say it, but Assange missed the boat in supporting TCI Journal. The editor just blames others when we complain. The loss of liberty of the people is being hushed by TCI Journal, so their transparency record is worthless in my opinion. Where the sunshine and spot light on everything? People are starting to talk about storming the police station and releasing this inocent man and whilst we are about it we should also drag the MP’s out of bed and hold them to account. The person who leaked the information made a pledge to server the american people against, both foriegn and domestic enermies and he did his duty and yet is also behind bars. Do you think MP’s stelling money and giving our money to the banks is the way to go or do you think it’s time we sorted this mess out once and for all. Justice in the UK is a joke the world over.